Our culture seems to be consumed with stuff. Now, there’s nothing wrong with stuff that serves a purpose, is used regularly, and brings enjoyment. However, most of us have too much of it! So that we are less tempted to add to our collection of things, here are some simple ways to cultivate a habit of contentment. I love the Blessings Journal by Crystal Paine (Money Saving Mom) that I received for Christmas. It’s refreshing to write down something I’m grateful for each morning. It’s such a great reminder to find something to be thankful for every single day – and it makes you realize that you have far more blessings to be thankful for than there is room to write them. This can be a tough one and I used to do it all the time. But lately I’ve tried to limit window shopping unless there’s something I really need. Then I’ll shop around and compare prices and quality. Make a list of things to do instead of shopping for fun – there are plenty of other ways to enjoy spending time. On my list is reading, having coffee with a friend, and coloring or hand lettering. In the words of Jon Acuff, “Stop comparing your middle to someone else’s end.” I just love that quote, because it’s so true. Often I’ve found myself comparing my life to someone else’s. There are so many reasons not to. Reason number one is because they are not YOU. Also, they are at a different point in their life. Even if they about the same age as you, they have different circumstances. I’m working on being content with where I am and at the same time working towards my goals. 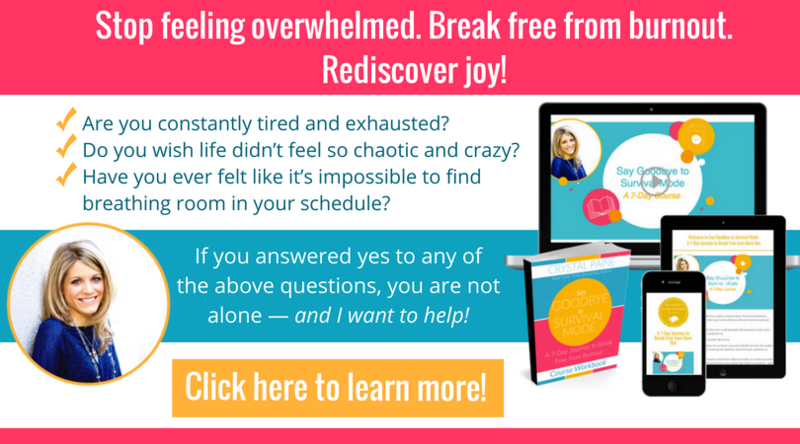 This course has given me such a great mindset shift on living more intentionally and ditch the stress! I can honestly say it’s one of the best, most impactful classes I’ve ever taken. Check it out for yourself here. This is some very wise advise. The one point that really spoke to me was make a plan for my goal. Sometimes I feel I’m just going through the daily motions…. No direct course to follow. This has made me very much aware and given me the motivation to change that. Thanks for helping me realize this. So glad you found it helpful, thanks for visiting! I do shop for “fun” sometimes, but I do it on a cash budget, with a goal in mind. Maybe I am getting a purse or a sweater. The fun is in finding one that works, under budget, instead of just shopping to see what I end up with. I don’t think there’s anything wrong with shopping for fun with a goal in mind, I do that too! What I try to avoid is shopping just to try to find something to spend money on with no goal i mind. Thanks for stopping by! Loved this post! I have found that a gratitude journal really helps! Unfortunately, I am not very disciplined when it comes to journaling, so I have decided to just write in my daily journal, but I try to make a point of recognizing some of the day’s “gifts”. It helps! Great tips 🙂 I also keep a gratitude journal. I totally agree with you. Its a good way to remind yourself how many blessings there are in your life. Rach D recently posted…How Do We Announce Such A Happy Occasion?? I love this article. It is true that even when very blessed, it is easy to get caught up in the “haves” and “have nots”. I think keeping a journal for both your blessings AND your wishes (with a plan to make them goals) would be beneficial. I will try that!! These are great suggestions. I truly believe that an attitude of contentment can be cultivated. This is something I also work on the with my children, using the same principles. I am not a religious person but this post still resonated with me because I keep trying to make sure that I’m not trying to keep up with the Jones’ in terms of parenting and our life style. I love the idea of a gratitude journal and can’t wait to start one! These are great reminders. Thanks for sharing. What great reminders. It’s so easy to get caught up in materialism, thank you for the gentle reminder to seek contentment elsewhere. Being better with shopping habits makes such a difference, because not only do you avoid buying things you don’t really need, you save money too! There are so many benefits for being content with what you have. This is so true, I have been keeping something very similar to a gratitude journal for years, and never realized it! Since I was about 19, I have been keeping a notebook in my bag/purse at all times so that whenever a thought strikes me, I can just write it all down. I love doing this, and continue it to this day (let’s just say many years later). I am just now working at becoming a goals orientated person. I have always been a dreamer, but never really worked at trying to make those dreams come true. I have been changing all of this more and more lately, and reaping the benefits. It’s amazing how turning dreams into goals makes life so much better! And yes, God does have a plan for all of us, even if we don’t see it. Love this Laura. I keep a thankful journal as well as a prayer journal. I love to see all my prayers checked off over time. I realize just how much God really answers every single prayer. May not be how I want, but to know that the God of the entire universe cares about ME is mind boggling! 🙂 Great post! I’m so glad you enjoyed the post, Sarah! I agree, it’s amazing to look back over journals and see how God has answered prayer and worked in my life. Thanks for stopping by! I love your tips – they are all so true! Contentment is a difficult thing to capture and even more challenging to hold onto. I love how you say that God has a unique plan for each of us. My best friend Sammi is so supportive, and one time when my hubby and I were experiencing a season of overflowing blessing in our life…I asked her if it was ok for me to share my joy with her or if I should keep it to myself….and she said…those are your blessings Sarah! God has something awesome planned for me too, so I don’t want your blessings…I am excited to receive my own, and excited to rejoice with you. That will always stick with me. LOVE THAT GIRL! “Make a Plan for Your Goals” change my life. Thank you again.